We've found it a big help on some shoots to cable the camera to our computer and evaluate each shot on the big monitor instead of relying on the camera's LCD for feedback. But plugging in the right software piece of this puzzle has eluded us. Until now. Capture One Pro. A tethered session under way. It isn't generally acknowledged but the EVF or LCD you rely on in your camera doesn't show 24-bit color like your computer. Those are 16-bit dithered color displays. Spec sheets tell you the number of dots in the display but never the bit depth. But which software package can you rely on for tethered shooting? We took a look at several that were compatible with our Nikon D300 and macOS Sierra. Compatibility is key. If you want to shoot tethered -- whether for eBay product shots or commercially -- see if your camera's manufacturer supports that option for your model and then see what software packages support your camera. Canon owners, for example, have a free tethered solution from Canon itself: Canon's EOS Utility for its more recent dSLRs. And some of the options we explore below also recognize Canon dSLRs, like Lightroom and Capture One. There's another important distinction to make among these options. Some like Nikon's Capture Pro and Sofortbild (or EOS Utility for that matter) are simply remote control for your camera. But others like Lightroom and Capture One integrate their advanced image editing functions. 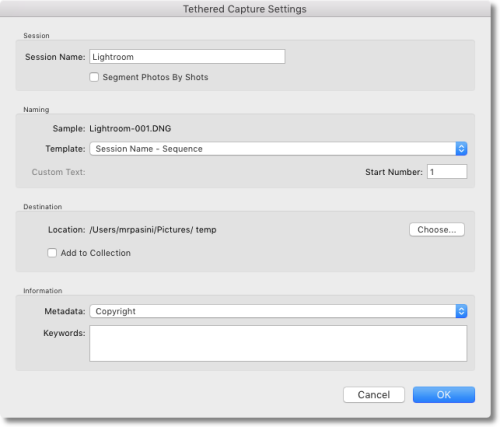 When you move your tether connection to an image editing application, you can shoot Raw and simultaneous apply image editing to the data to display a more finished image at capture. Tethered shoot can be a battery drain, particularly if you indulge in Live View. That's about the only drawback we've found, though. All of these products rely on each camera manufacturer's software development kit. These SDKs evolve over the years, dropping some older models as the camera developers try to keep up with modern operating system releases. But even the latest SDKs don't always resolve issues with tethering new cameras on new versions of the operating system. It reminds us of keeping an old scanner running by keeping an old system healthy as a dedicated scanning station. You could freeze an old system's operating system and application software that you know works with your camera. But you give a lot up. Display technology has improved dramatically and no doubt your editing software has too. Why not plug those advantages into tethered shooting? Unfortunately there's no VueScan for tethered shooting. Those evolving SDKs make or break compatibility. You may find that you have to resort to a camera manufacturer's tethered solution to get back in business. Don't be surprised if your camera storage behaves differently when tethered. Your camera has to send the image data to your computer for display. Nikons consequently don't bother saving the file to the camera's internal storage card, although Canon cameras can. It can take a surprisingly long time for an application to recognize your camera is tethered. And in some cases, it's instant. Most of the applications launch with the assumption there's not camera there, so you'll see a message to that effect ("No Camera Detected" is one such). Don't be alarmed. It's not reporting a condition. Just wait it out a bit and most likely your camera will be recognized shortly. Not all of these solutions provide comprehensive camera control. Live View support is spotty on Sofortbild and non-existent in Lightroom, for example. But it works in Capture One Pro and Nikon's Capture Pro 2. But when you physically set up for tethered shooting you may find it just as convenient to control the camera at the camera as to control it from the keyboard. Particularly if you are working with a live model. For one thing, you have to frame the set. So you're at the camera to begin with and may have to move the camera around a bit. You may not even be shooting on a tripod, after all. So don't feel obliged to use the application's camera control. On the other hand, it's a real blessing to be able to sit down, turn on Live View, adjust focus, fire the shutter, evaluate the exposure, change the aperture or shutter speed and take another shot. That's usually what we're doing. And you may also be able to adjust the power ratio of your lighting setup if your camera provides the option. You know how to figure out your physical set up. It isn't any different from how you'd shoot untethered, frankly. You do have to account for your camera's connection to your computer. If you have a WiFi connection, you're all set. If you have a cable connection (typically USB), you'll want to make sure you aren't at all likely to yank the connection. We uses a very long (and cheap) USB cable extension attached to the USB cable that came with our camera. That works fine, even with Live View, over USB 2.0. But software setup is worth taking a moment to think through no matter what application you are using. You'll want a "session" name, which you can think of as a shoot stub or folder name. You'll also want a destination directory for these images. And you'll want to remember to evaluate your images based on whether they are JPEGs with many display settings baked in or Raw files. And if you're working with Raw files, you can apply presets or a selection of image edits to the data as well. While the new cloud-focused Lightroom does not offer tethered shooting, it's been in for Lightroom Classic [MW] a while. In fact, our first tethered sessions were done with Lightroom Classic as the control room. And when that worked, it was fine. But from one revision to another, the camera was and wasn't recognized enough that we learned to look elsewhere. And, frankly, only recently have we been able to use it again for tethered shooting. It takes a while to recognize the camera and even then the controls are very limited (although they do permit applying a preset) and there's no Live View option. Lightroom Settings. Pretty limited but accessible via the gear icon on the shooting bar below. Lightroom. Minimal controls, no Live View. If you're going to work on the images in Lightroom, though, there are some advantages to using its Tethered mode. You can automatically add images to a collection, apply presets and add both metadata and keywords. 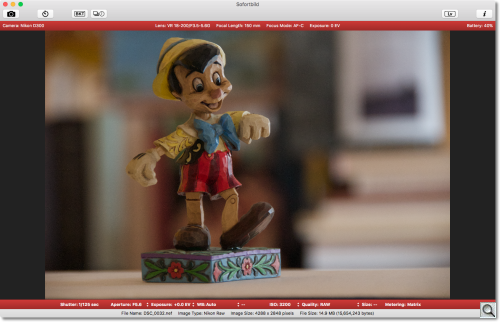 Sofortbild [M] provides a free solution for Nikon shooters, although it seems to remain perpetually in beta. That doesn't mean it doesn't work, though. In fact, it's been very reliable for us, although the latest release notes indicate ongoing issues with Live View for the D90, D3s, D5000, D7000 and D800 (the D300 too, unfortunately). But we have been turning to it first lately. Support for Sofortbild is strained (the company is just "two people working on a fun project in their spare time") but there is a blog where you can glean intriguing tidbits about tethered shooting and the issues in building software to support it. And the company does list older releases to provide tethered shooting for cameras dropped by the manufacturer's current SDK. The top red bar of the display shows your current non-editable settings while the bottom bar shows options Sofortbild can control plus a couple of others. There are a few more options on the title bar, too, plus a battery status display. 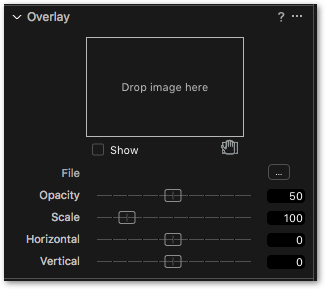 An Inspector panel can display the histogram, Exif data (and more) of the capture as well. You'll have to visit the Preference panel to set the destination folder. It takes moment after you snap the shutter for camera to focus and the data to arrive on your computer and be displayed but we didn't find that a problem. As a camera-centric solution and despite its Live View failure, we liked Sofortbild enough to rely on it as our main tethered solution for some time. Nikon's Capture Pro 2 does provide comprehensive camera control and does implement Live View. But it doesn't display your captures for evaluation, recommending ViewXN-i for browsing images. Nikon Camera Control Pro. Five screens of information including battery level but there's more (like destination) in the menu system. Nikon Camera Control Pro. Small buttons set focus and fire the shutter. Apart from its failure to display captures for evaluation, Capture Pro provides complete control over the camera. You may have to hunt around a bit for any particular option (look in the Preferences and on the menu bar) but don't give up. It's probably there. Our best example of that is setting the destination directory for your captures. It isn't in the Storage panel of the control pane where you might expect it. Instead, it's in Transfer Options on the menu bar's Tools option. Using Capture Pro was a pleasure. 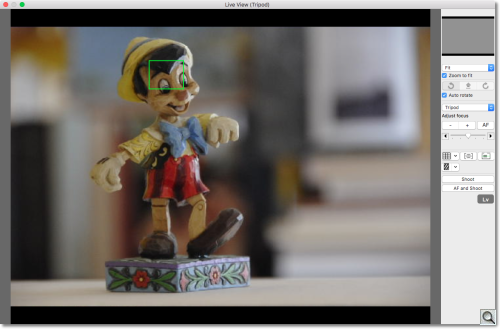 We particularly liked setting focus in Live View by just dragging the focus target around with our mouse. But not easily being able to evaluate the capture (and the high price of admission) encouraged us to look elsewhere. 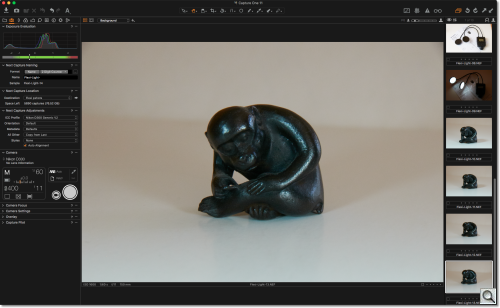 When Phase One released Capture One Pro 11 [MW], we thought we'd give it a try. We had a tethered job to shoot and had used v10 on a tethered shoot just a few weeks earlier. That experience didn't end well but we didn't have time to diagnose the problem, which had to do with failing to save the shots in a specific folder. We liked the interface, though, so we were anxious to try v11. And once we did, we found a better solution to our tethered shooting workflow. In addition to its online help, Phase One provides a comprehensive User Guide with a complete chapter on tethered shooting. Start a new Session or if you prefer, you can use a Catalog instead. Open the Capture Tool Tab. 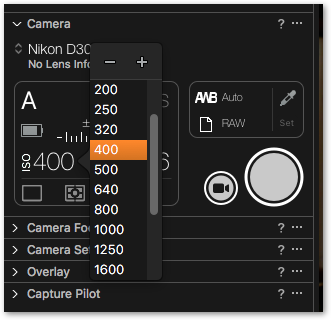 When a supported camera is connected and powered up (see your camera documentation for the supported transfer specification), Capture One will immediately recognize the model and populate both the Camera and Camera Settings tools with the relevant camera menus and settings. From the Camera Settings tool, select the desired camera settings from the appropriate drop-down menu or using the +/- buttons. For example, ISO, exposure mode (Av/Tv/M or P) and File format. Note the available camera settings depends on the support for the camera model. Press the Capture button, located in the Camera tool. Set the white balance by clicking on the brightest white area with detail in the captured image, using the White Balance picker (eye dropper) tool located in the Camera tool or Cursor tool bar. Check the Next Capture Adjustments tool settings. The Copy from Last choice will copy the settings from the previous capture and will ensure that resulting images attain a similar look. Tethered Dialog. All the settings. Exposure Evaluation which provides a histogram to evaluate exposure. An exposure meter below the histogram also indicates under- or over-exposure based on a center-weighted measurement. Next Capture Naming which allows you to configure the file name in a separate dialog box, providing a preview. Next Capture Location which sets the destination folder and name while showing remaining space. Next Capture Adjustments which provides some post-capture options including applying an ICC profile, dealing with metadata, applying adjustments and using Styles. Camera which reports the camera and lens, if available, and presents a compact display of the camera settings, including battery status. The shutter button (and a Live View button that looks like a movie option) are also displayed. This panel has a number of subpanels that become available after the camera is identified. 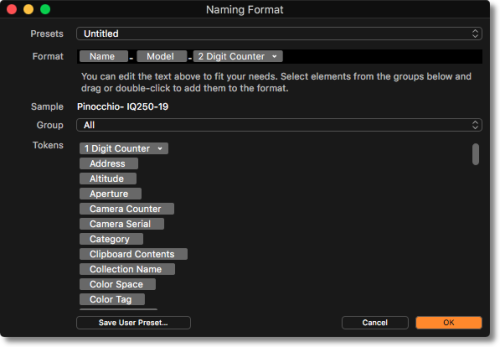 You want to set the Naming, Location and Adjustments settings before anything else. And you may want to refine your Adjustments settings between captures. Among the available modes (including Live View), Capture One Pro provides a Composition mode (Camera > Composition Mode), which simply overwrites any previous capture to save disk space. It's very handy for test shots, saving both disk space and file maintenance chores. And you can add tools like Exposure Evaluation, Next Capture Adjustments, Next Capture Location and Next Capture Naming to the tool tab. File Naming. With counter options. You build the name from a set of variables displayed in the dialog. It's a rather extensive list that includes things like a counter, the camera serial number, date, the session name and more. The counter alone allows six options, all a question of the number of digits. If you have only a handful of shots, for example, you might select the single-digit counter. If you have thousands, you'd want at least the four-digit counter. The panel displays a preview of your name configuration so you can be sure it's what you want. We've found it helpful to put delimiters like hyphens in the template rather than in the name itself. Make and Model were generic in the preview. Location. Where the images will be written. You can set the destination folder and its name here. There are defaults so you can skip this and you can also change it on the fly as the session develops. Remaining space on the device will also be calculated. Adjustments. Profile, metadata, Styles, etc..
One of the benefits of using a full-blown image editing application to do tethered captures is that you can immediately apply a set of image edits to the capture. These include basics like applying an ICC profile, setting the image rotation and adding metadata. But with Capture One Pro it also includes applying Capture One Presets and Styles. Several of these options allow you copy the settings from the last capture, a primary variant or the clipboard. Adjustments. Fly-out menus present the options. You can change a variety of camera settings from within Capture One Pro. The layout reminds us a little of the Phase One XF's LCD, which we greatly admired. Those include Mode, Shutter, Aperture, EV, White Balance, File Format, Drive mode, Metering mode and Autofocus mode. Fly-out menus are used to display options when you click on any of the settings icons. The one peculiarity we found in Capture One was that it alone of all these applications could not detect our lens (despite saving it in the Exif data). Focus. Autofocus was our only option. Clicking on the AF button activated autofocus. If our lens was set to Manual focus only, the AF button was disabled. We weren't able to do anything else with the Focus tool, which is implemented primarily for Phase One XF/IQ system camera and certain Sony cameras. So we simply relied on autofocus and if that hadn't worked out, we'd have set the lens on Manual and focused manually from the camera. You can apply an overlay to a Live View preview or a captured image. PSD, DNG, TIFF, GIF and PDF formats are supported as well as BMP for Windows users. The overlay itself must have a transparent background layer. You just drag and drop the file to the Overlay tool's target. You can then adjust the opacity, scale and placement of the overlay. Why? Well, if you were shooting a magazine cover (or any graphic) and needed to avoid the type, you could drop the cover overlay in as an aid to composing the image. Pilot Server. Starting the server. 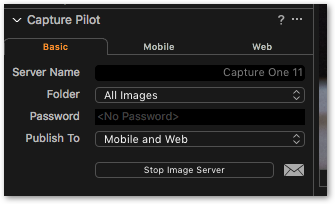 The Pilot option starts a server from Capture One that will deliver the tethered captures to your mobile device with the free Capture Pilot app installed. You can display a histogram with camera settings, rate images and set the white balance. A $14.99 in-app purchase lets you access camera controls so you use your phone as a remote control. Capture Pilot App. Camera settings display on an iPhone 6 Plus. This turns out to be a nice addition to the tethered experience, particularly if you are working with a team. Rather than huddling around the monitor, everyone can have their own view (and opinion) of the results. Live View has its own two-tab interface that includes a viewer. It worked well with our setup but the basic panel is so well designed that we didn't feel required to use it. 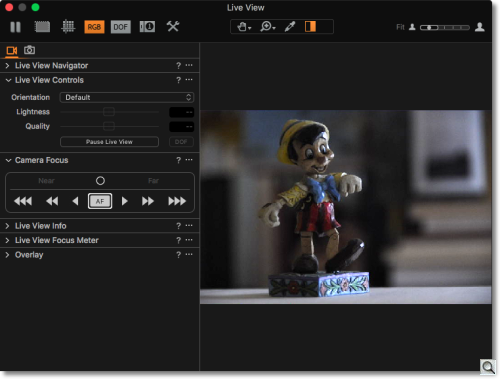 Capture One Pro Live View. Settings panel. 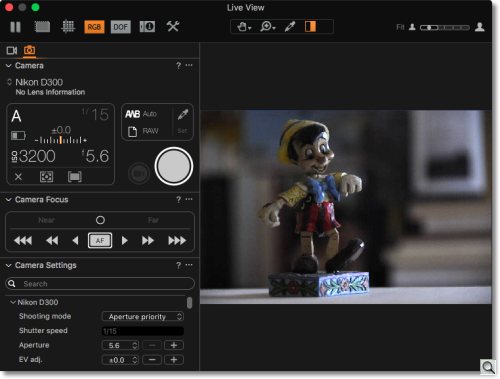 Capture One Pro Live View. Shooting panel. You can add more tools to the toolbar, as well. Live View is supported on medium format and certain Canon, Nikon and Sony cameras, Phase One notes. Our requirements for tethered shooting are rather modest so all of these products were able to complete the job satisfactorily. But that doesn't mean they're all equals. Free solutions are always a good way to get your feet wet but the lack of a reliable Live View function lost the otherwise competent Sofitbild points. And not having an image browser hurt Capture Pro 2. Neither program offered the extra image editing control of Lightroom or Capture One Pro. Lightroom was simply too minimal. No bells, no whistles. And considering Adobe's focus on mobile computing, it isn't likely to get more attention. But it's a handy tool if you don't leave the Lightroom ecosystem. Capture One Pro, though, was actually a delight to use. If we needed something it was not only there but easy to find. The interface, complex as it is, is easy to use, too. The one possible downside to shooting tethered is how quickly it depletes your battery if you use Live View. Otherwise, the advantage of having a big screen display for a viewfinder is hard to resist for studio shooting. 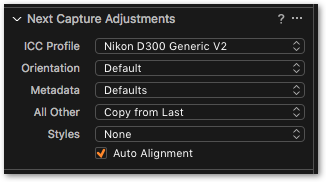 Of all the options available to use on a Mac with a Nikon D300, Capture One Pro provided the most reliability and flexibility. Period. Second place? Nikon's own Capture Pro 2 -- but that's $150. Which is half of Capture One Pro's full price.